This house is located in the Coelha area, with a pleasant location, a few minutes away from Coelha beach (500m). The house is close to the restaurants and to the shopping facilities (200m). Outside of the house there is a swimming pool, a surrounding terrace, garden, BBQ and exterior shower. Inside the house you have 1 twin bedroom, 1 bathroom, kitchen, living and dining room. On the 1st floor there is 1 double bedroom ensuite and 2 twin bedrooms and 1 bathroom. This house is located in the Cerro da Águia area, with a pleasant location, a few minutes away from Sao Rafael beach (3,5 km). The house is close to the restaurants and to the shopping facilities (1,5 km). Outside of the house there is a swimming pool, a surrounding terrace, garden, BBQ and exterior shower. Inside the house you have the kitchen, living and dining room, 1 wc, 1 double bedroom ensuite, 2 twin bedroom both ensuite. 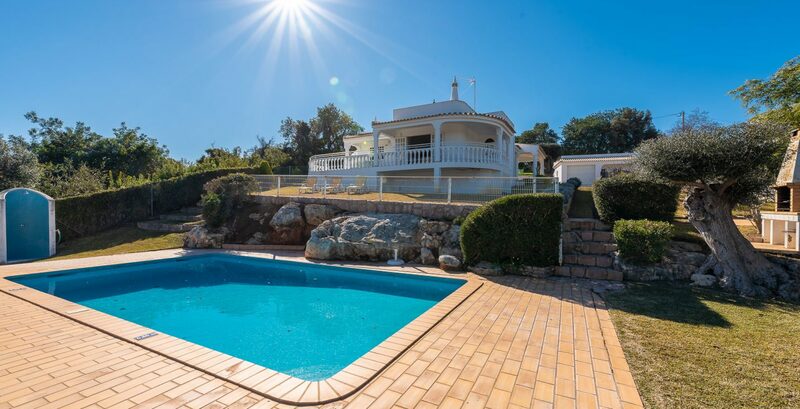 This house is located in the Clube Albufeira, only few minutes away from the town of Albufeira (2 km). The house is close to the restaurants and to the shopping areas (2kms). Outside of the house there is a swimming pool, a surrounding terrace, garden, BBQ and exterior shower. Inside the house you have 1 double bedroom ensuite, 1 wc, 1 kitchen, living and dining room. 1st Floor is composed by 1 double bedroom ensuite, 1 twin bedroom, 1 bathroom, terrace. This house is located in the Alamos area, with a pleasant location, a few minutes away from the town of Guia (3 km). Outside of the house, there is a swimming pool, a surrounding terrace, garden, BBQ, and exterior shower. Inside the house, you have 1 double bedroom ensuite, 1 WC, 1 kitchen, living and dining room. 1st Floor is composed of a master bedroom suite, 1 double bedroom with bathroom, 1 twin ensuite. This house is located in the Vale de Parra area, with a pleasant location, a few minutes away from Praia da Gale beach (3 km). The house is close to the restaurants and to the shopping areas. Outside of the house, there is a swimming pool, a surrounding terrace, garden, BBQ and exterior shower. Inside the house, you have 2 twin bedroom, 1 double bedroom, 1 bathroom, kitchen, living and dining room. Borehole water – The water supplied to the villa is from a borehole, we advise bottled water for consumption. This house is located in the Cerro de Águia area, with a pleasant location, a few minutes away from Sao Rafael beach (3,5m). Outside of the house there is a swimming pool, a surrounding terrace, garden, BBQ and exterior shower. Inside the house you have the Kitchen, the living and the dining room, 1 double bedroom ensuite, 2 twin bedroom, 1 bathroom. 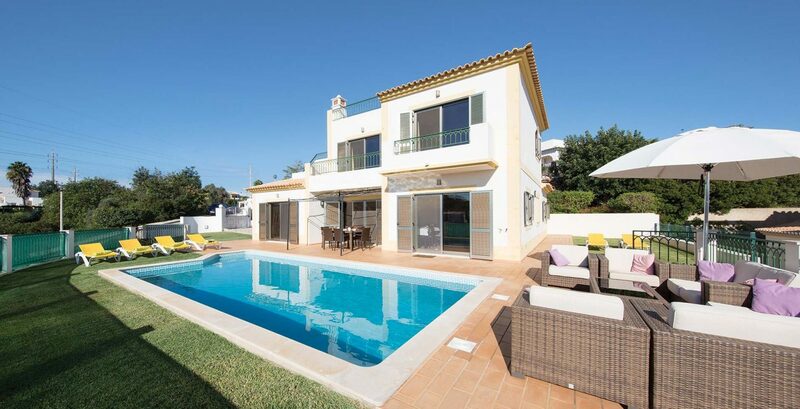 This house is located in the Patroves area, with a pleasant location, a few minutes away from Castelo beach (3,5 km). The house is close to the restaurants and to the shopping facilities (2 km). Outside of the house there is a swimming pool, a surrounding terrace, garden, BBQ and exterior shower. Inside the house you have 1 twin bedroom, 1 bathroom, kitchen, living and dining room. On the 1st floor there is 1 twin bedroom and 2 double bedrooms and 1 bathroom. This house is located in the Coelha area, with a pleasant location, a few minutes away from Coelha beach (800m). The house is close to the restaurants and to the shopping facilities (400m). This house is located in the Cerro de Aguia area, with a pleasant location, a few minutes away from Albufeira and Fishermans beach (3,5 km). Outside of the house there is a swimming pool, BBQ and exterior shower. Inside the house you have WC by the front door, Living/dinning room with fireplace and TV SAT, 1 kitchen with microwaves, 1 WC, 1 bathroom, 1 twin bedroom. The first floor is composed by a small reading room with access to the roof terrace. From the reading room we lead on to the hall with two twin bedrooms, both with balcony, sharing a bathroom with shower cabin. The villa has at the clients disposal one portable AC unit, which can be moved from compartment to compartment. This house is located in the Sítio da Ilha da Madeira ( Guia ) area, a few minutes away from local shopping area and restaurants. Outside of the house, there is a swimming pool, a terrace, a garden, a BBQ and exterior shower. Inside the house, in groundfloor there are 1 double bedroom ensuite, 1 WC, the living room and the kitchen; and in the first floor 3 twin rooms ensuite. The water supplied to the villa is from a borehole, we advise bottled water for consumption.